ROME -- Fiat Chrysler Automobiles CEO Sergio Marchionne said he sees Samsung Electronics as a potential partner amid interest from several potential buyers of its Magneti Marelli auto-parts unit. He didn’t confirm talks with the Korean company. "We have a very good relationship with Samsung, both as a supplier and as a potential strategic partner," Marchionne said on Saturday in an interview with Bloomberg Television in Rome. "I happen to have a good relationship" with Samsung Electronics Vice Chairman Lee Jae Yong because both serve on the board of Exor, he said. Marchionne declined to comment on whether Samsung would eventually make a bid for the Marelli unit. Samsung is in advanced talks to buy some or all of the Marelli operations, people familiar with the matter said earlier this month. Samsung is particularly interested in Marelli’s lighting, in-car entertainment and telematics business and could consider an acquisition of the whole company, the people said, asking not to be identified because the discussions are private. Samsung's Lee will visit Europe at the end of this month to participate in Exor's board meeting and discuss the acquisition of Magneti Marelli, Maeil Business Newspaper reported Aug. 25. Negotiations with FCA have slowed recently over differences about the valuation of the businesses, the South Korean newspaper said. After calling off efforts to pursue a merger with General Motors, Marchionne has made reducing debt his highest priority before he leaves his post in 2019. Achieving the goal would put Fiat Chrysler, the first major carmaker to strike a deal with Google on driverless vehicles, in a better position to find a partner. Marchionne contends that the auto industry needs to consolidate to finance investment in new technology. Marchionne said that while Fiat has had several suitors for its auto-parts unit, "we are not interested in just selling Magneti Marelli, which has a strategic value to us." The Italian CEO, who grew up in Canada, predicted that "whatever happens with that business going forward, it won't happen overnight" as the unit "is going to provide a significant platform for technology development." 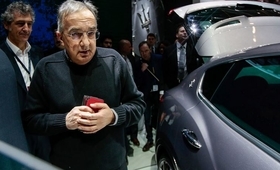 An eventual sale of Magneti Marelli would help Marchionne achieve what analysts see as the most challenging part of his five-year strategy, which includes more than doubling net income, reducing its debt and building a cash reserve of at least 4 billion euros ($4.5 billion).